We Americans love our gadgets and we waste a lot of energy when we leave our gadgets plugged in. One of these "energy vampires" is a cordless phone. The whole time it's plugged in, which is 24/7, the phone is sucking energy. A corded phone uses a miniscule amount of energy that comes directly through the phone line. 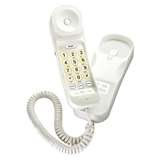 If you have several cordless phones in your house, consider downsizing to just one (that can be used all over the house) and converting other connections to a corded phone. I have an old corded phone on hand for emergencies and it has come in handy! When we had a weeklong power outage back in December of 2006 we were able to plug it in and call around and find a place to stay. Nothing else in our house turned on including the furnace, pellet stove fireplace insert or cordless phones. I looked up about this here and here.